The Decorator, a Norman Rockwell painting, appeared on the cover of The Saturday Evening Post published March 30, 1940. This is another favorite of Rockwell collectors, a classic enduring image of the world Rockwell painted. An alternate title for this painting is Woman With Fabric Samples And Chair. This painting was Rockwell's 192nd overall out of 322 total paintings that were published on the cover of the Saturday Evening Post. Rockwell's career with the Post spanned 47 years, from his first cover illustration, Boy With Baby Carriage in 1916 to his last, Portrait of John F. Kennedy, in 1963. This was also the first cover for The Post in 1940. In 1940, there were seven Norman Rockwell Saturday Evening Post covers published. The original oil on canvas painting, 36 x 30 inches or 91.5 x 76 cm, is part of a private collection. In this painting, Norman Rockwell shows us a potential conflict betwen husband and wife. The husband is sitting in his old comfortable chair. He is enjoying his pipe and reading his newpaper. His wife, the "decorator," is seeing how she can spruce up the room. One of her options is changing the upholstery on her husband's chair. Notice the look of concern on his face. His favorite place in the world, his haven, is being threatened with sprucing up. The fabrics the wife is considering do not look like what this fellow considers manly. 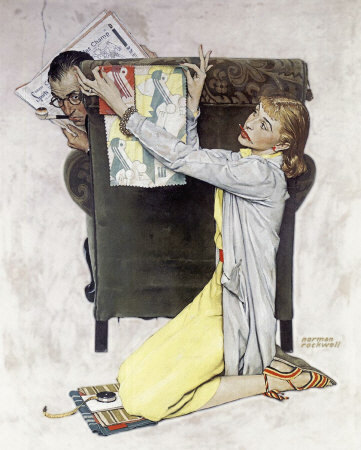 The Decorator was only one of 322 Norman Rockwell Saturday Evening Post covers; Here is the list of Norman Rockwell Saturday Evening Post cover illustrations. The woman seems determined to carry through with her decoration on their living space. Maybe they can reach a compromise. Maybe the man can just buy a new chair for the space and move his old favorite to another room. Do You Have A Great Story, Opinion Or Contribution About The Decorator?